Gates of Arimyth • View topic - Cannot Log on to Arimyth. Post subject: Cannot Log on to Arimyth. Has the update not been added to Arimyth? I have downloaded the norm res, old music MP download. I erased my old folder and replaced it with this one. Post subject: Re: Cannot Log on to Arimyth. (the page you linked to isn't an image, so won't be displayed with the image tags). The servers have not been updated yet (Duff hasn't been on the forum in a couple weeks), but I have used v1.7b (both Multiplayer and Solo versions) to play on the realms without trouble (just don't make a Lvl1Necro and try to place a point into RaiseSkeletonMage (or a Lvl18Necro placing a point into BSpirit) since that will cause you to drop as if you'd tried to sell your Cube). Just keep in mind that you're playing v1.7a online. 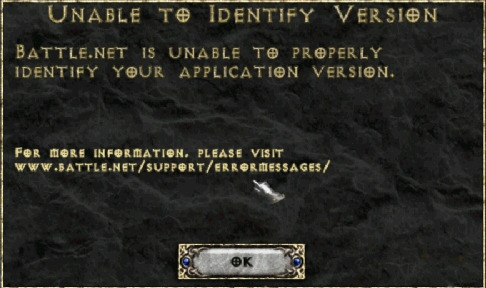 If you feel like downloading again (I suppose the download might be corrupt, since it's unlikely you forgot to choose the Arimyth Gateway at the main menu), keep in mind that you could download the Solo version (access to special charms that could make v1.7 more enjoyable) to try offline or in TCP/IP, while you'd still be playing the multiplayer version online. If you wanted to play a Skeleton or Bone Necro immediately with a group of friends or something, then here's a link to HUv1.7a CoreFiles Update and NormRes_OldMusic_Multiplayer, since you deleted the old one. For reference, I downloaded Norm Res / MP / No Music and New Music patches. Both returned the same message. If you've got the time, you could download the v1.7a files above, and confirm that you still have the problem (this would confirm that the issue isn't mod or update related). Is there any possibility that at some point your D2 install got updated past LoDv1.10 (or v1.13 if you're using D2SE)? Vanilla D2 is v1.14 nowadays, so if someone played Vanilla online with your computer or you're using a recent install from Blizzard's discs, then the best solution would be downloading Ensley03's HU FileTree (comes with v1.6 folder in the Mods folder). A LoD version other than 1.10 (or beyond v1.13 if using D2SE) would probably cause the error you're seeing. Which gateways are available for you to choose from at the Main Menu (I'd expect only Arimyth is available, and is selected)? This is not the same as the realm select option at the character select screen (I'd expect only HU is available, and is selected). A non-Arimyth gateway could probably cause the error you're seeing. In the D2SE mods folder, you've got a folder for HUv1.7b. In that HUv1.7b folder you've extracted one of the download packages (MP_NoMusic_NormRes, etc) and have about 32 (NormRes) or 34 (HighRes) files or folders in that mod folder. You don't have to run d2ModSetup.bat or do anything else after extraction, just run D2SE (some of the files are for non-D2SE players). Yes to all your questions, but I did not check the base version to see if anything had changed. Additional information: I can play single player with no troubles (it's just harder bc mp install). The core files are for 1.10f Diablo 2 LOD. This is the value that the hu.reg file assigned when I double clicked it, to be sure. These match what is in D2SE_Setup.ini. Edit: I think I know what happened. I'm going to test something out. EDIT: There are a bunch of new files in my core installation of D2 that were put there when I installed the launcher for Median XL. I think those altered the files such that I can no longer connect. I'm going to try a fresh installation. Friend is having the same problem, can't connect but hes not using D2SE. Confirmed he had 1.10v before HU install. Confirmed single player works fine.